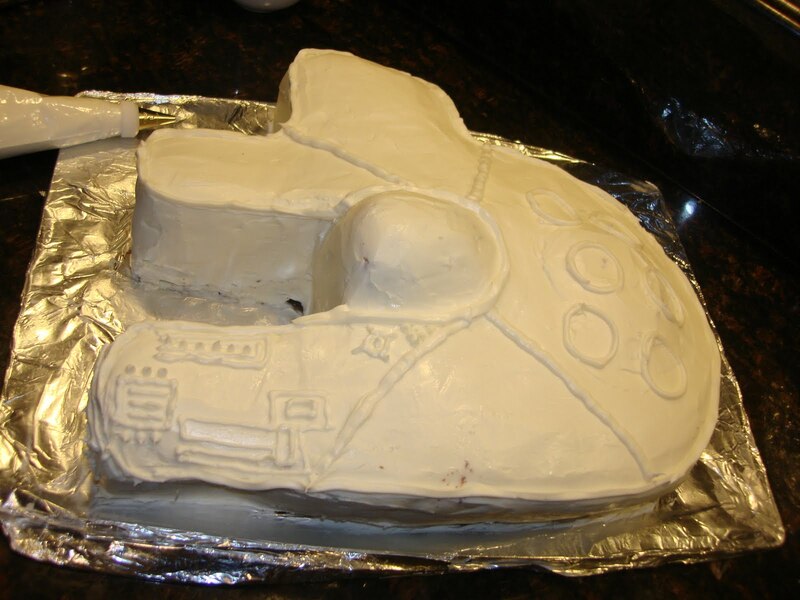 What exactly does it take to make a Millennium Falcon cake? It being the thought foremost in everyone’s mind, I thought I’d share. It takes two boxes of chocolate cake mix, a vat of homemade chocolate buttercream and a good amount of vanilla frosting. I’m talking an alarming amount of vanilla frosting—like eight tubs of it. 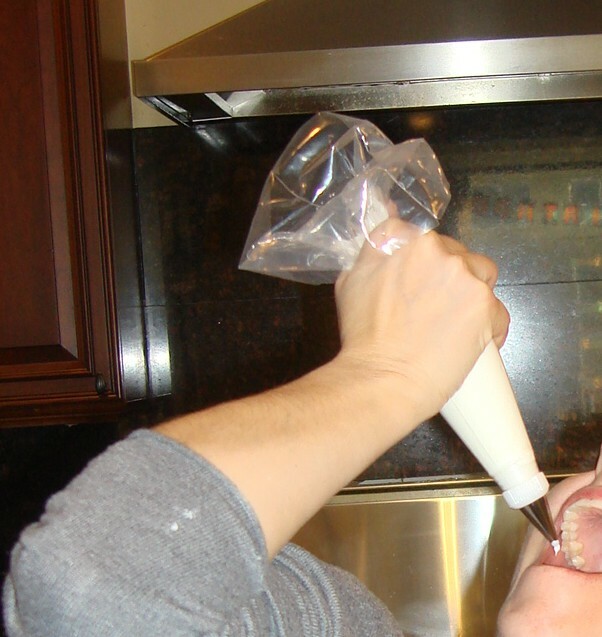 For those of you counting calories at home….oh, never mind. This post isn’t for you. My sister and I undertook the making of this fantastical cake for my nephew’s birthday. It took hours to create over the span of two days. We whipped up a decadent buttercream frosting for the center, baked off a chocolate cake the size of a hula hoop and tinted a fraction of our otherworldly quantity of vanilla frosting three different colors: metal gray, blue and black. 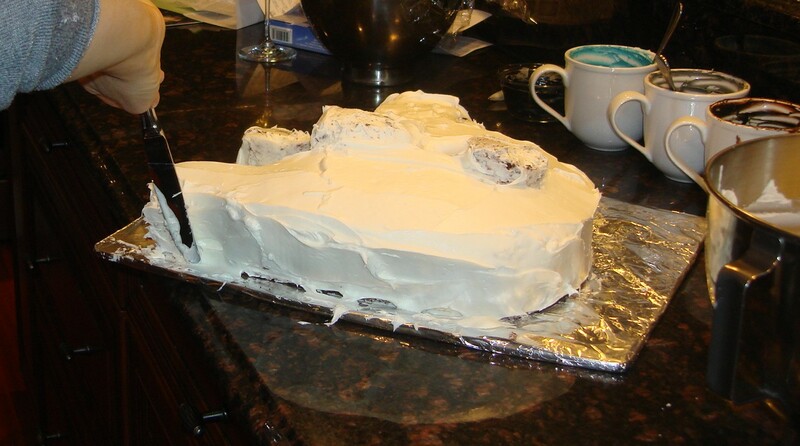 We cut and shaped our enormous cake into what we figured looked like an approximate shape of the Millennium Falcon, applied a crumb layer of frosting and allowed it to chill. We were so proud of ourselves and downright giddy with anticipation at what my nephew would think. Oh, the glee he’d exude when we revealed the cake! 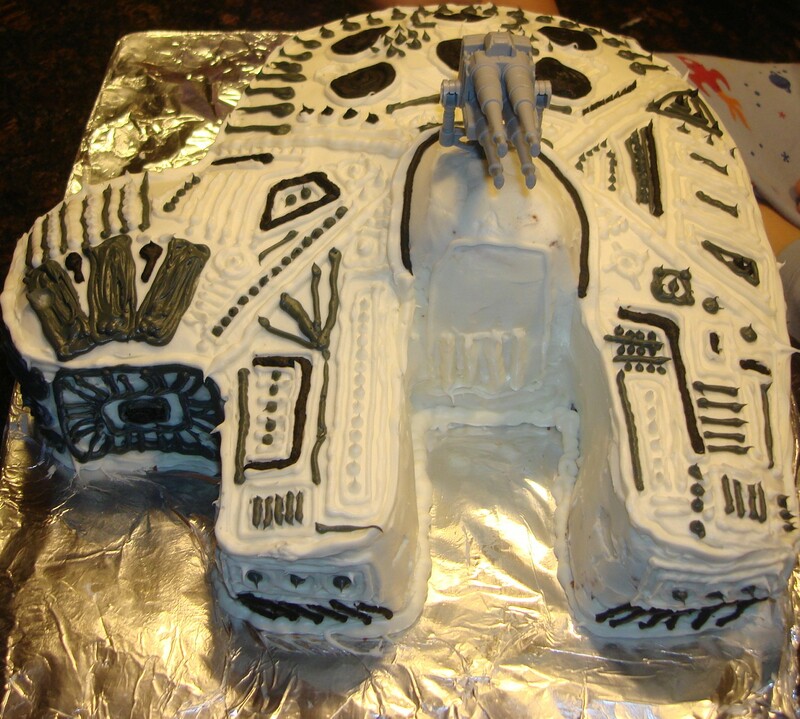 Undeterred, we forged ahead with our elaborate piped frosting plan—white for all that ubiquitous detail work commonly found on the outside of space ships, metal gray for yet more detail, black for…wait for it…even more detail. And there was some thick blue piping on the back for the smokin’ Hyper Drive. Or is it the Warp Drive? I always confuse the faux technical terms from StarTrek and Star Wars. 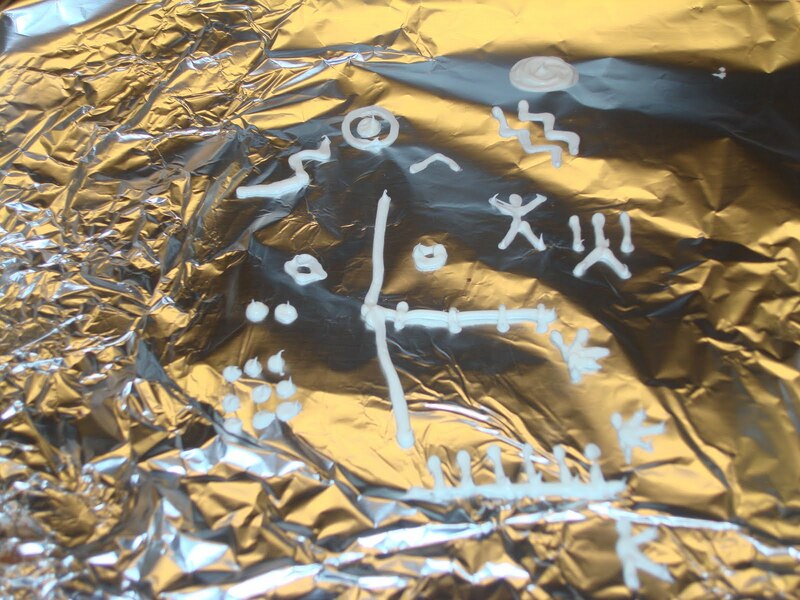 …we piped all the details on the cake. And then we piped some more. For hours we piped. Literally. Yes, there is such a thing as “piper’s cramp.” Inexplicably, some frosting was lost in the process. 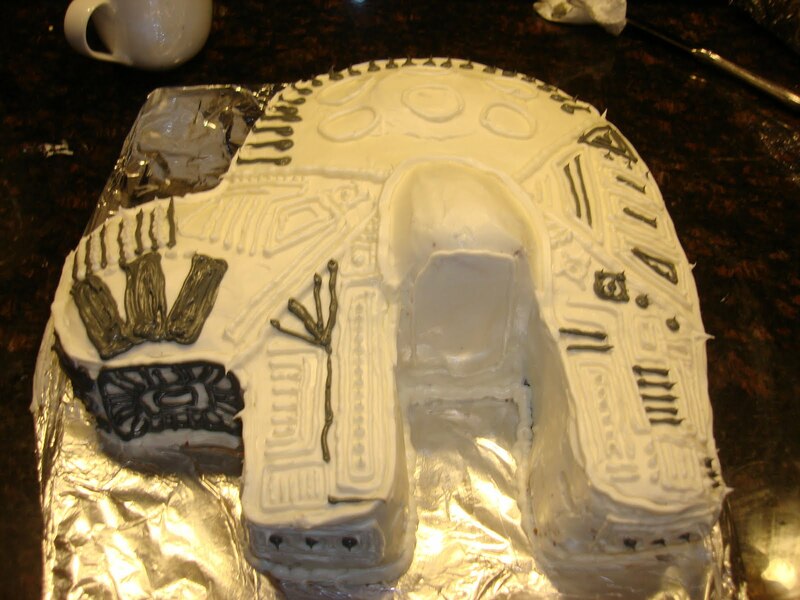 What we ended up with was a close facsimile of the Millennium Falcon—or at least as close as we were ever going to get after having consumed a sickening amount of frosting. The best part? My nephew not only recognized it, he actually liked it. He’s gracious to his elders like that. It is, after all, the Jedi way.